The past few years have been interesting times for Kenneth Anger soundtracks. First it was an elaborate boxset compiling Bobby Beausoleil's soundtrack and session work for Lucifer Rising, and then this year saw an official release of Jimmy Page's aborted soundtrack for Lucifer Rising. And now we have Peggy Sue's homage to the soundtrack of Scorpio Rising, perhaps Anger's most accessible film and in terms of popular culture certainly his most influential. Anger's 1964 experimental short Scorpio Rising focussed on a gang of Coney Island bikers racing and cavorting, amidst cuts of swastikas, skulls, black cats and captured images of the era's rebel icons Marlon Brando and James Dean. Anger frames his description in occult terms explaining Scorpio Rising as a film about "the myth of the American motorcyclist...Thanatos in chrome and black leather and bursting jeans". Kenneth Anger's innovative and inventive use of pop songs in Scorpio Rising has been well noted as an influence on Martin Scorsese and David Lynch and is often regarded as blueprint for MTV. Financial restraints have always scuppered an official soundtrack release but Peggy Sue's ironic take on an ironic and iconic soundtrack is an engaging and disarming take on the original soundtrack. The genesis for Peggy Sue's release came following an invitation from Assemble to perform a live soundtrack to a film at a temporary cinema in Hackney, East London. Peggy Sue chose Kenneth Anger's cult classic Scorpio Rising because of its "groundbreaking Rock and Roll / Doo Wop soundtrack". As Peggy Sue note on the insert, "with no dialogue or captions Anger was one of the first to use pop music to harness and alter the meaning of his images". Anger's use of pop songs on Scorpio Rising while complementing the images acted as an ironic commentary to the visuals. Intentional or not, and I suspect it wasn't but in many ways Peggy Sue's take on the songs of Scorpio Rising, works in a similar manner to Anger's use of pop music, this time, with the twin female voices of Peggy Sue complementing and contrasting with the underlying homo-eroticism and flagrant machismo on show. The response to Peggys Sue's initial performances was overwhelmingly positive and coupled with the band's enjoyment it saw them slipping into the studio over the next 6 months to record their arrangements of the pop songs featured. The results are to be found on Peggy Sue Play The Songs of Scorpio Rising. The music of Peggy Sue is at times lo-fi and almost garage sounding with sweet female harmonies that recall the girl group sound that features heavily on the soundtrack (The Angels, The Crystals, Martha and the Vandellas, Little Peggy March), alongside tracks from Ricky Nelson, Bobby Vinton, Claudine Clark, Kris Jensen, Gene McDaniels. When compared to the original productions, Peggy Sue's arrangements can be quite rudimentary at times but they possess a charm of their own offering a unique take on these tracks, many of which have become classics. The vocal leads and harmonies from Rosa and Katy are especially strong and drummer Olly Joyce plays a central role in many of the tracks. Listening to this it's clear that Peggy Sue really shine on the girl group numbers. On 'My Boyfriends Back' Peggy Sue stay true to the original from The Angels, performing this staple of the girl group sound in an almost C86 indie style. Even without the horns, 'Heatwave' retains the energy and stompin' feel of the Motown classic. 'He's A Rebel', which features parallel images of the rebel Scorpio figure cut-in with footage of Jesus from a Lutheran Sunday School film, is performed as a lo-fi garage take on the Phil Spector production with the vocals and harmonies floating over chiming guitar and intricate drum patterns. Just as they take the arrangement and lyric of The Crystals number elsewhere they push Claudine Clark's 'Party Lights', which features the biker drunken antics at a Halloween party, further into girl group territory with stunning lead vocal and harmonies over guitar and keyboard. I love it. Like the original Little Peggy March version 'Wind Up Doll', which showed images of bikers tinkering with their customised, chrome machines juxtaposed with cheap plastic wind-up toys, is performed to a tick-tock rhythm, while Peggy Sue add moments of thunderous drums amongst twangy guitar. The immediacy of Little Peggy March's 'I Will Follow Him' is maybe lost amidst the stark setting of twee indie guitar and harmonies over the recurrent drum rolls. As charming as they are, not all of Peggy Sue's interpretations come close to the originals. 'Blue Velvet', unsurprisingly, never manages to capture the allure of the Bobby Vinton original. In fairness Peggy Sue don't even attempt it opting for an arrangement of voice and drums, swamped in buzzing guitar chords. This rudimentary take really misses the dreamily fetishistic nature of the leather boys with their belts, buckles, caps and chains. They nail 'Torture' though, with a swooning beautiful female vocal over acoustic guitar, keyboard, shakers and spartan beats, with chugging buzz chords towards the end. In Anger's film 'Hit The Road Jack' as sung by Ray Charles is played out to visuals of bikers intercut with footage of Marlon Brando (from The Wild One), James Dean death newsclippings, black cats and skull and crossbones. It's obvious that death is at hand; Thanatos is lurking. So Peggy Sue's early southern blues arrangement with wailing chanted vocals over slave rhythm beats is an ingenious take well suited to illustrate the death obsession of the bikers. Even where they don't tackle the original arrangement the strength of their harmonies hold their own and carry the spirit of the original. So where 'Fools Rush In' and 'Point of No Return' are reconfigured in more skeletal forms with twangy or chugging guitar and some interesting drum turns, the restrictions of being a three piece in no way break the atmosphere. Peggy Sue Play The Songs of Scorpio Rising plays out beautifully. What makes this really worthwhile is the twists Peggy Sue add to 'Torture', 'Party Lights' and 'Hit The Road Jack' and the fun they add to the girl group numbers. 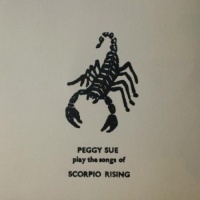 Peggy Sue Play The Songs of Scorpio Rising is performed as a labour of love, right down to the self-released status as a signed edition, in a hand stamped sleeve with printed insert. Given his infamous temperamental nature, who knows what Kenneth Anger would make of Peggy Sue's interpretations, but at the very least they draw out the fun of this 1960s soundtrack bringing with it a fresh audience to Anger's seminal film and hopefully to their own albums too. I had fun synching this with the DVD. If you're looking for the real deal though then check out Attack of the B-move Muzak blog who have compiled the original tracks into an unofficial soundtrack album. But Peggy Sue, where's Elvis' '(You're The) Devil In Disguise'? And how about a take on the Paris Sister's 'Dream Lover' from Kustom Kar Kommandos as an extra? Below are some original visuals Peggy Sue have made for Peggy Sue Play the Songs of Scorpio Rising.